I replied. Sorry I wasn't here earlier. Love your new avatar Blue! We will all be thinking of you when you have your surgery. Hugs! Wow, I had no idea it was so late. I got up late today and got busy with other things, but didn't sleep until like 6:30 or 7 Am. It's always weird when I go to bed when the birds are waking up. Saturday I will be staying overnight at my friend Diane's which is always fun. I will be in contact by using her I pad thingy and stopping in to see everyone. My work was based on this photo. 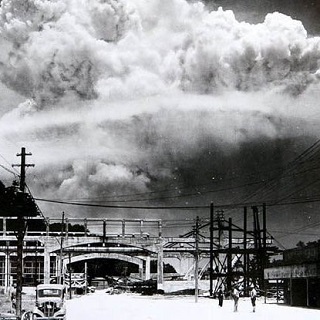 There are three men standing at the bottom right of the photo viewing the explosion as it occurs. Thank you for your well-written thoughts on that day. Nervous about surgery? Not the actual surgery, I'm nervous that the cardiologist will deem me unfit for the operation for whatever reason. Sitting here relaxing and enjoying YouTube videos. I am having dinner at 6:10 AM. Potatoes, meatballs and hot taco sauce. Well, in any case, you need fixing somehow. Maybe we'll have the pixies make you some kind of elixir or something. I enjoy the violin. Talented young lady!